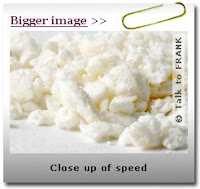 ‘Speed’ is the street name for a range of amphetamines such as amphetamine sulphate, dexedrine and dexamphetamine. Like cocaine, amphetamines are stimulants that people take to keep them awake and alert. The effects of amphetamine kicks in within half an hour of ingesting it by mouth. If you inject it you’ll experience the effects quicker and these effects can last for up to six hours. The high is generally followed by a long slow comedown. Street names for drugs can vary around the country. Amphetamines, Speed; Dex; Adderall; Dexamphetamine; Bennies; Dexies; Black Beauty; Jollies , Phet, Billy, Whizz, Sulph, Base, Paste, Dexies. * Speed makes people feel wide awake, excited and chatty. * Clubbers take it because it gives them the energy to dance for hours without getting tired. * Amphetamines was once the main ingredient in diet pills because it stops people feeling hungry. You can get strongly addicted to amphetamines. The more times you take it, the more you’ll need to get the same buzz. Speed is usually sold in wraps. The powder is off-white or pinkish and can sometimes look like small crystals. The ‘base’ form of speed is purer and is a pinkish-grey colour and feels like putty. ‘Crystal meth’ (methylamphetamine or methamphetamine) is a particularly powerful, addictive and dangerous form of speed that comes in a crystalline form. Prescription amphetamines like dexamphetamine are usually small white pills. They are used to treat conditions like attention deficit hyperactivity disorder (ADHD). Speed is either dabbed onto the gums or is snorted in lines like cocaine using a rolled up bank note. Sometimes it's rolled up in cigarette paper and swallowed, called a speedbomb. It is also mixed in drinks. To obtain rapid high blood levels in heavy users it is also injected or in the case of ‘crystal meth’ smoked in its 'Ice' form. * Depending on how much has actually been used, it can be difficult to relax or sleep after taking speed . *The come down can make users feel irritable and depressed and can last for one or two days. *Speed users have died from overdoses. *Speed puts a strain on your heart. *Combination of speed with anti-depressants or alcohol has been known to be fatal. *Taking a lot of speed can give your immune system a battering. You could get more colds, flu and sore throats if you use it a lot. *Speed can lead to anxiety, depression, irritability and aggression as well as mental illness such as psychosis and paranoid feelings. *Prepared-for-injection speed may can cause vein damage, ulcers and gangrene (deadening or decaying of body tissue especially the digits and limbs) and especially with dirty needles. Shared needles and injecting works can help the spread of viral hepatitis and HIV infections. Injecting ‘speed’ may be particularly dangerous because it's so impure. It's also easier to overdose when injecting.